MICHIGAN STATE UNIVERSITY SPARTAN STADIUM photo - Empty MSU Spartan Stadium picture photo print - MSU Spartan Stadium photo - East Lansing, Michigan - picture art photograph prints: This MSU Spartan Stadium picture photograph is made from an original hand colored black and white fine-art photograph. This wide angle photograph shows a completely empty MSU Spartan Stadium with billowy clouds in the background. In two days MSU Spartan Stadium, with its 72,027 seats, would be sold out and filled to the hilt with thousands of screaming MSU Spartan football fans watching the defeat of rival Ohio State. Just before the annual matchup with The Ohio State Buckeyes this photograph is a graphic illustration of the calm before the storm at MSU Spartan Stadium. TO SEE THE OTHER MSU SPARTAN STADIUM PHOTOS, INCLUDING SPARTAN STADIUM AERIAL PHOTO, ON THIS MICHIGAN STATE UNIVERSITY SPARTAN STADIUM PHOTO WEBSITE JUST CLICK ON THE 'BACK TO MSU PHOTO GALLERY...' LINK JUST ABOVE THIS PHOTO TO TAKE YOU THERE. 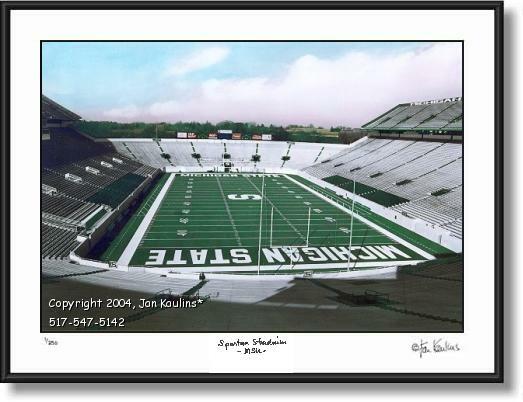 Michigan State Football Sports Art, Spartan Stadium Art, Spartan Stadium Art , Michigan State Stadium Football Artwork, Michigan State Spartans Picture, Michigan State Stadium Artwork, Jan KaulinsArtist Artwork, Spartan Football Picture Art Print, Spartan Stadium MSU photo picture, Michigan State University Spartan Stadium photo picture art.